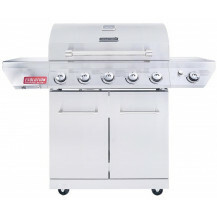 The Megamaster Sizzler 320 Patio Gas Braai has two side tables and two wheels to make it easier to transport. Prepare your food easily right next to the braai by using the side table. You do not have to transport the meat in and out of the house but the best part is that you don’t have to walk far to put down the bowl for the beat. Megamaster Gas Braai does not come with a gas cylinder. This gas braai requires a 9 kg gas cylinder.